As the sun rose over Lake Titicaca light poured into our room from our balcony window. I nudged Miro to wake up as we knew we needed to start out early. We met Daniella and Omar for breakfast in the hotel and began to prep for the day. The boat taking us to Isla del Sol departs from the dock across from our hotel at 8:30. 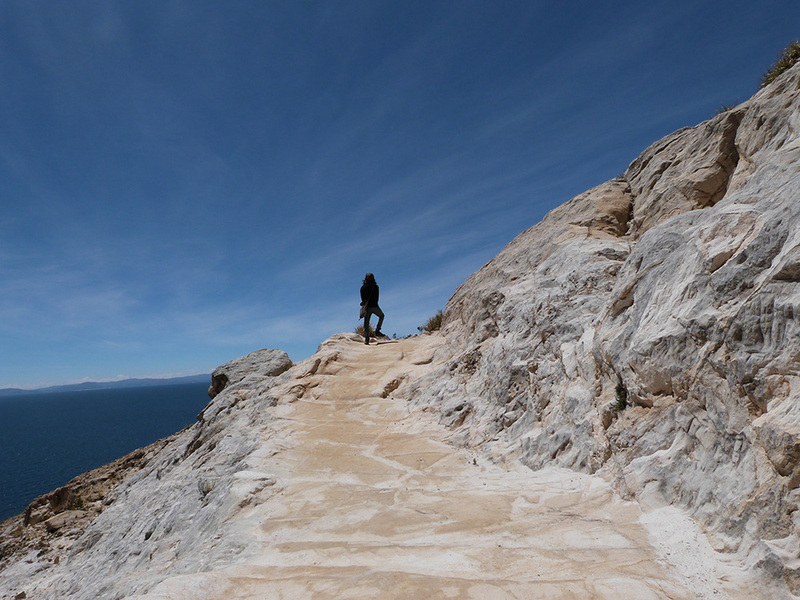 Isla del Sol is an island in the southern part of Lake Titicaca and is part of the modern State of Bolivia. Its terrain is rocky and hilly with many eucalyptus trees. The night before I had been absorbed in a book written by a Bolivian investigator who is seeking the opening to the caves leading into the pre-Colombian underground cities. In addition to his archaeological investigations, he also experienced extraordinary metaphysical visions involving time portals, meetings with the spirits of the ancient ones who originally came from the star system Sirius and founded a civilization here on earth which was part of the mysterious continent of Mu and Lemuria over 20 thousand years ago. The book is called In Contact with the Grand Masters by G. Antonio Portugal Alvizuri. 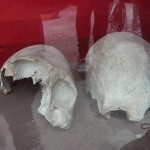 It’s an interesting tale and coincides with much of myarchaeological research into the elongated skulls in Paracas, Peru, our encounter with the alien hybrid mummy in Andahuaylillas and other investigations throughout our travels. I have always been fascinated by this line of investigation and I neither claim its validity or deny it, rather have discovered I am excited to explore deeper, learn everything I can from all angles and go as deep as I possibly can. Exploring ancient sites such as Isla del Sol have such meaning to us as Miro and I discuss and explore all the possibilities and mysteries found within history. According to G. Antonio Portugal Alvizuri one of the many things I learned about the ancient Aymara culture who settled around the lake ages before, was that it is customary to ask the spirit of the lake permission to cross. Daniella, Omar, Miro and I boarded the boat along with 20 other passengers, a mix of tourists and locals. We found a seat on on the wooden benches and according to tradition, I mentally asked the spirits of the lake for permission to cross. I am confident that my silent prayer was granted as we had calm waters and a clear passage for our two hour voyage. 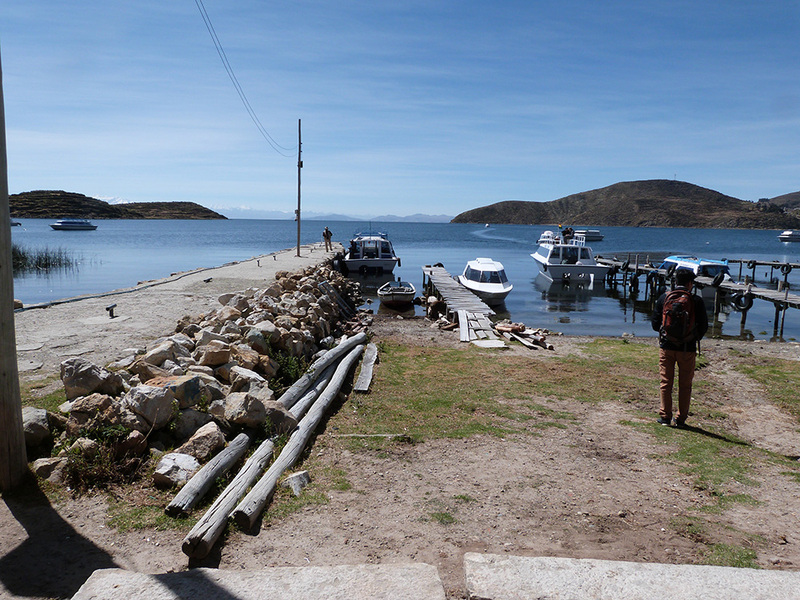 Our plan for the day was to explore both sides of Isla del Sol and head over to Isla de Luna for the later part of the afternoon. Isla del Sol is the largest of all the lake islands measuring 5.5 miles by 3.75. 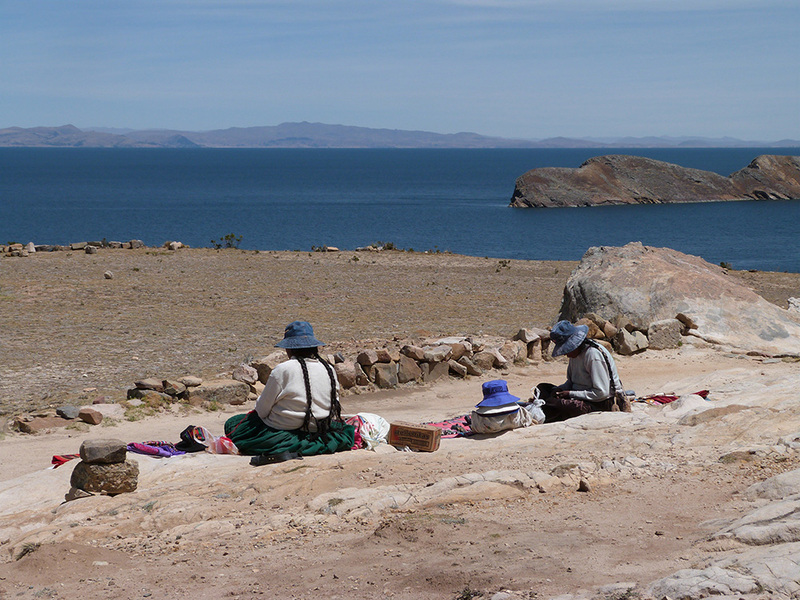 Isla del Sol is revered as the most important site within Inca mythology. Isla del Sol is thought to have been the birthplace of the bearded Sun God, Viracocaha which is at the center of the Inca culture of beliefs. But all tour guides I’ve read simplify history by saying first Viracocaha was born and then he created the sun followed by the first two Incas. 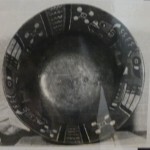 But to put some perspective on the table, the Incas culture existed from the early 13th century to 1572, when the Inca Empire were conquered by the Spanish. The nearby site of Tiwanku has the sun gate which features a carving of Viracocha ( future post) was thought by conventional archaeologists to have been built as early as 1500 BC (and some alternative investigators such as Arthur Posnansky estimated that Tiwanaku dates back to 15,000 BC, based on his archaeoastronomical techniques.) which is much earlier than the birth of the Inca culture. Regardless, this place is certainly special to the inhabitants of the distant past and the immediate present. 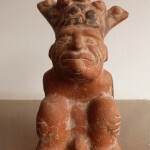 According to the Inca belief, there from the depths of Lake Titicaca, Viracocha rose up from the lake (perhaps like a UFO) to create the Sun in the sky above, the universe surrounding, then subsequently he breathed life into the first two Incas who are known as Manco Capac and Mama Ocllo (the Adam and Eve of the Andes). Archaeologists have found evidence of existence of people on this island dating back to the 3rd millennium BC, which predates the Inca by two thousand years. Upon Isla del Sol, there more than 80 ruins scattered about on the tiny island. This is truly an energetic place filled with history and mystery. Isla del Sol has four or five small villages that are home to the island’s permanent population and tremendous views wherever you look. 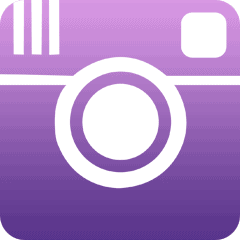 Today, there are around 800 families and their main mode of survival is tourism, fishing and farming. There are no vehicles on the island and the only mode of transportation is walking. There is a 20km walk that cuts over the spine of the island to the Chincana ruins, the island’s biggest Incan ruin, and returns along the coast passing through a few villages. Tour guides swear it only takes a few hours to complete the entire circuit. We disembarked on the north side of the island in a small pueblo called Challapampa. From there, we made our way to the northern starting point, stopping first to explore a rustic makeshift museum called the Museum of Gold, displaying artifacts found around the island and underwater surrounding the island. 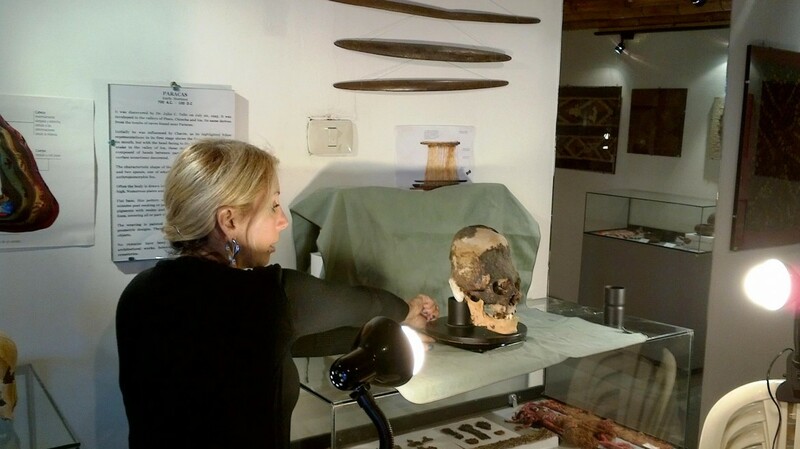 We spent much time there as I examined each artifact from side to side, top to bottom. After a longer than usual visit, Omar and Daniella knew we were in trouble with the amount of time we had allotted to explore the entire island. We set out with best intentions to explore the entire island, see each of the main archeological sites and take in the spectacular views. However Omar and Daniella soon discovered that Miro and I were not your typical tourists, highly engaged in the history surrounding us and transformed into an investigative state. 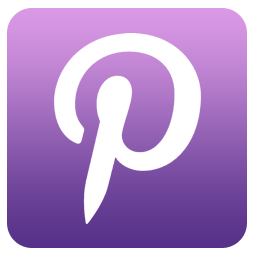 Readers of our blog know that I personally love all archaeological ruins (sometimes to Miro’s annoyance) and I tend to move very slowly, looking at rocks, construction, layout in search for uncovered mysteries. So be it. 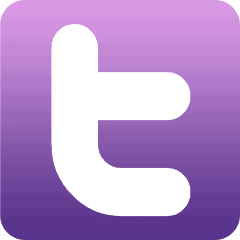 We are worldschoolers and life learners, after all. After the museum, we started our journey up the rocky hillside incline away from Challapampa. 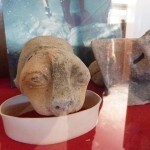 On the path, we passed two anomalous sites, first the sacred rock carved in the shape of a puma. Then, we observed two very large footprints. These are said to have been created when the sun dropped down to earth to give birth to Manco Capac and Mama Ocllo. 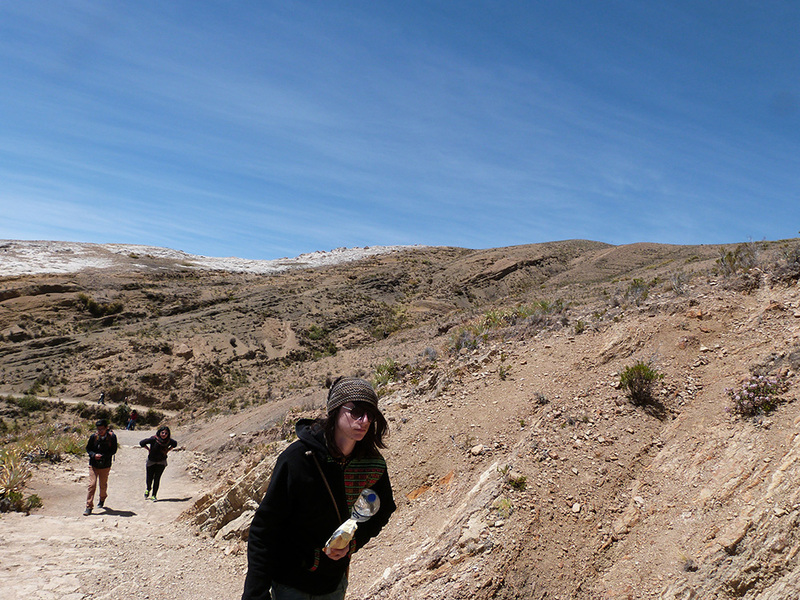 We continued our way up the rocky path towards the site of “Chinkana”. Chinkana is known to the locals as the labyrinth. The Chinkana is a huge stone complex filled with mazes, built in the typical Inca construction we’ve seen throughout Peru. 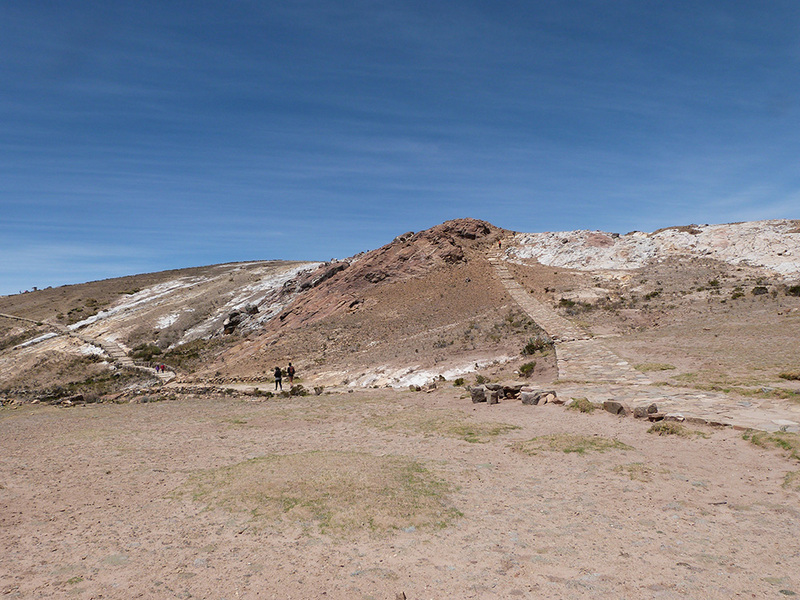 According to the guide books, this site is thought be a training center for Inca priests. 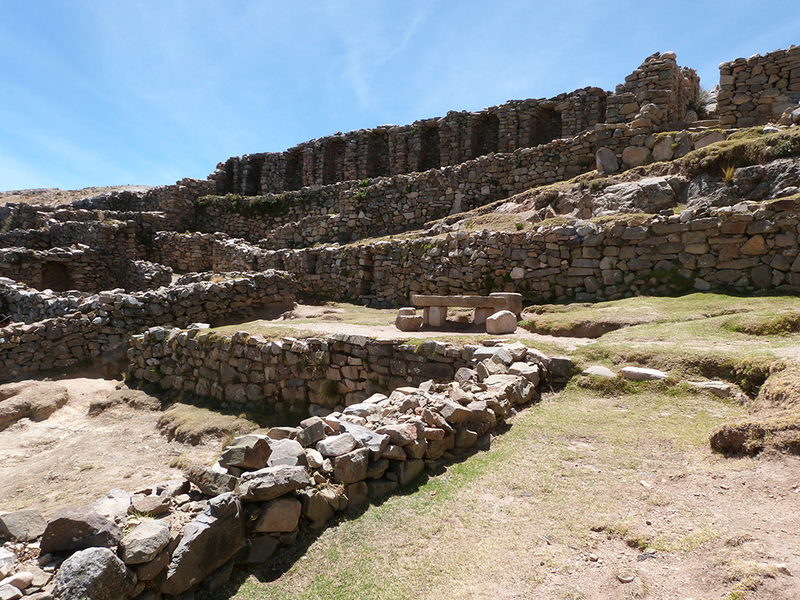 Some archaeologists theorize because of the “sloppy construction” as compared to the expert building found at the “Inca sites” of Saksaywaman, Ollantaytambo to name a few, the builders must have been in a rush to build it. 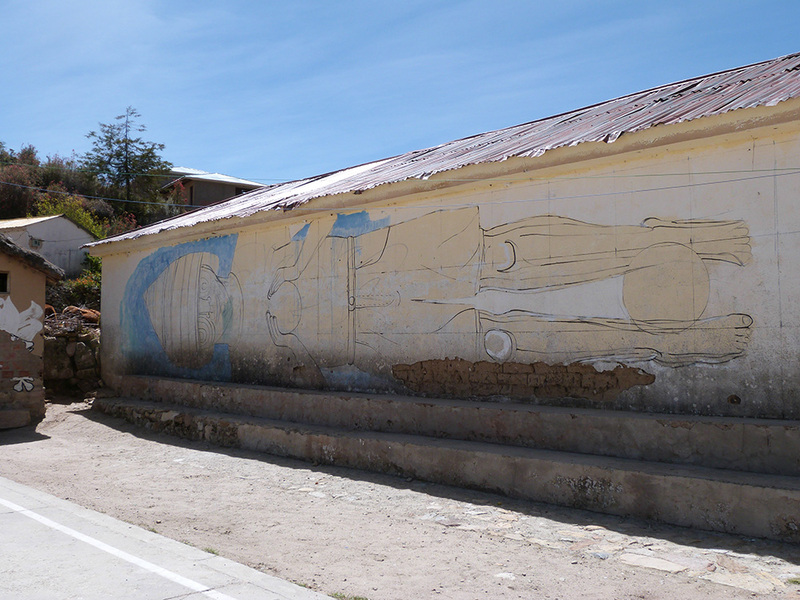 Throughout our explorations among hundreds of archeological sites from Mexico to Bolivia, we’ve heard many such stories, and we’ve began to discern some of these stories, which seem to be told as a way to create a cohesive story to weave meaning into site we were visiting. 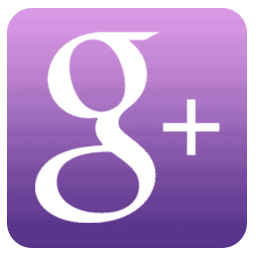 But in reality, no one really knows…. Within the center of Chinkana site, a beautiful fountain can be accessed. Daniella and Omar told us this was known among the locals as the fountain of youth. The source of the fountain is a natural spring that runs under the island and appears again in a sacred stone fountain in Yumanion the south side of the island. 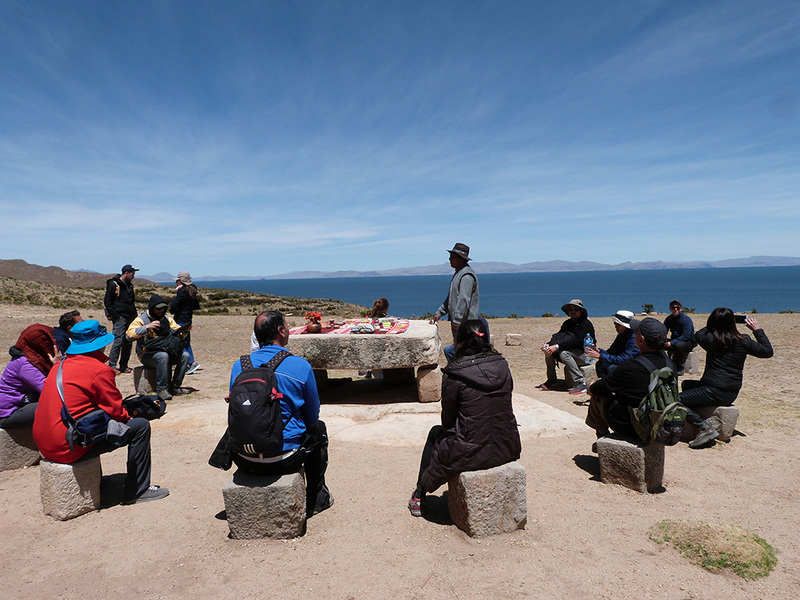 There, we also saw what the guides called “the Inca table”, a place where sacrifices were made. Again, another assumption to make sense of the artifacts left behind, but in reality one does not really know. From our perspective, Miro and I remarked it looked like those stones were originally a part of a much larger (perhaps sunken) structure and the stones were moved. There were no stones of that type anywhere else in the northern part of the island and to us, it looked like a later culture re-used some of the older artifacts for a functional purpose. But who knows, we are are only amateur archaeologists. 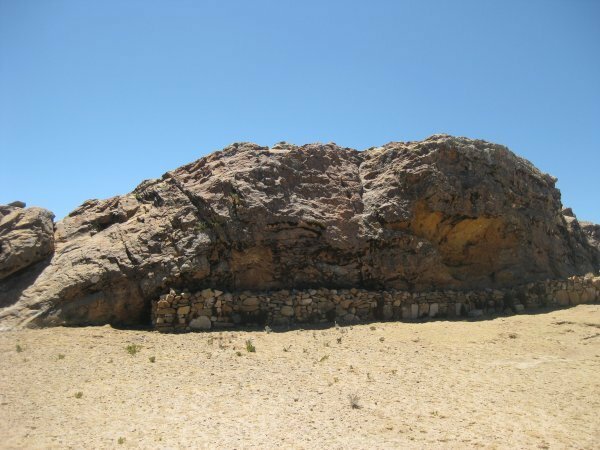 However, if the research of the author G. Antonio Portugal Alvizuri whom I mentioned in the beginning of this article, is true, there are massive underground cities which can be found deep within the depths of Lake Titicaca. 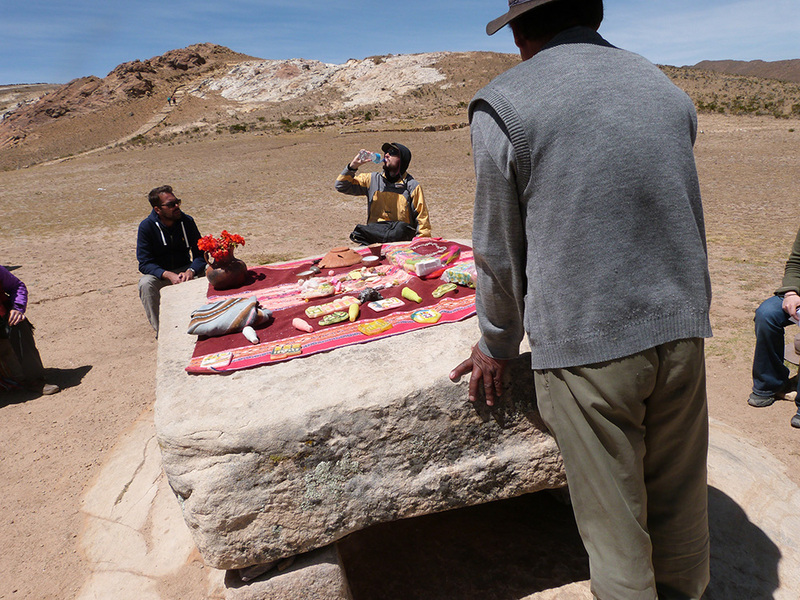 Perhaps there, we will find large carved stones, like the one that creates the table top at the site known as the Inca Table. Up on the hill above the Inca Table is a site overlooking the lake called Temple of Pilcocaina, which is a surprisingly well preserved Inca settlement. We managed to explore the norths side of the island for hours and hours and decided we did not have time to make our way to the south side of the island and to our disappointment, nor did we have time to explore Isla del la Luna. Here is some of the research I found based on what others have written about those two areas for your reference. 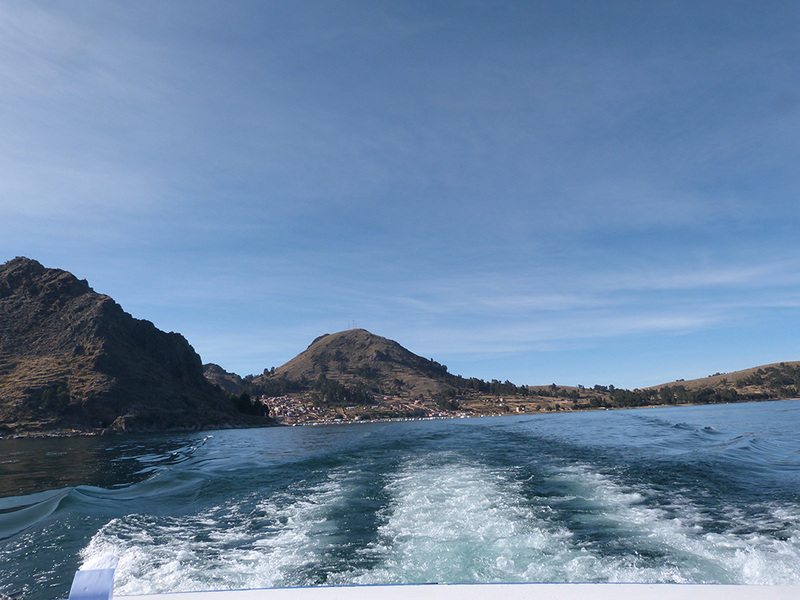 An hour’s boat ride from Isla del Sol will take you to Isla de Moon on the eastern side. Isla de Moon is comparatively smaller than Isla del Sol and should take about an hour or hour and a half to explore the entire island. Maybe double that for Miro and myself. Known for its mythological significance to the Incas, legend says that Viracocha commanded the moon to rise here. The Island of the Moon is the legendary home of the Inca goddess Mama Quila. 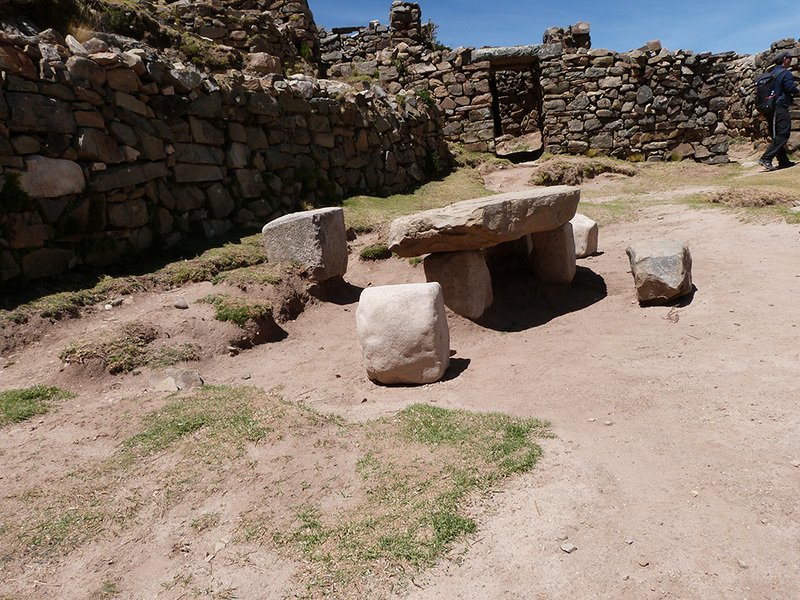 The structures on this island were originally built by the pre-Incan Aymara culture, but the Incas left their mark on the architecture as well such as the typical trapezoidal doors. (Darn!! I wished we had time to see it! We’ve seen doors of the same construction at the site of Ollantaytambo in Peru and know there are similar ones at at Tiwanku which we have yet to explore) During Inca times, the Isla de la Luna housed chosen women known as the “Virgins of the Sun,” who lived a nun-like lifestyle. They wove garments from alpaca wool and performed ceremonies dedicated to the sun. Did someone say fresh trout? 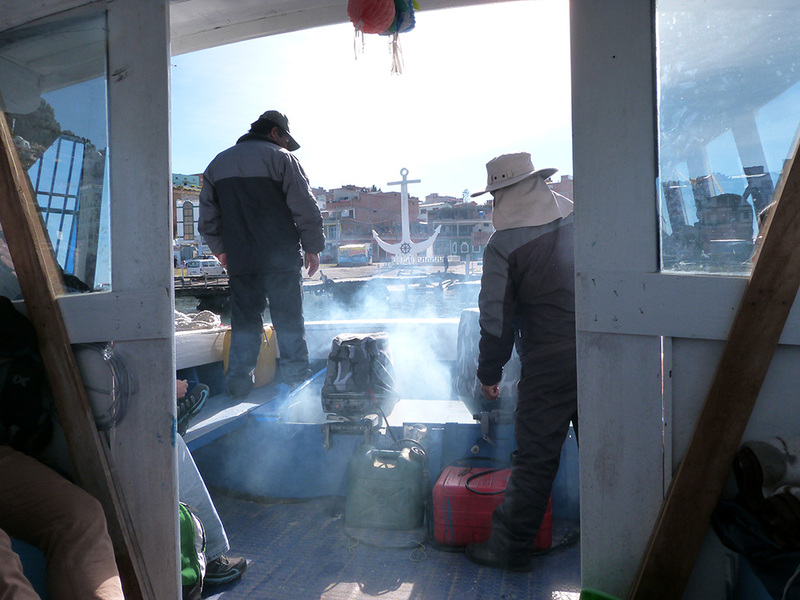 We landed on an “isla flotante”, a floating reed island where the fisherman and chefs who are one in the same, gathered to serve fresh fried trout to their customers. 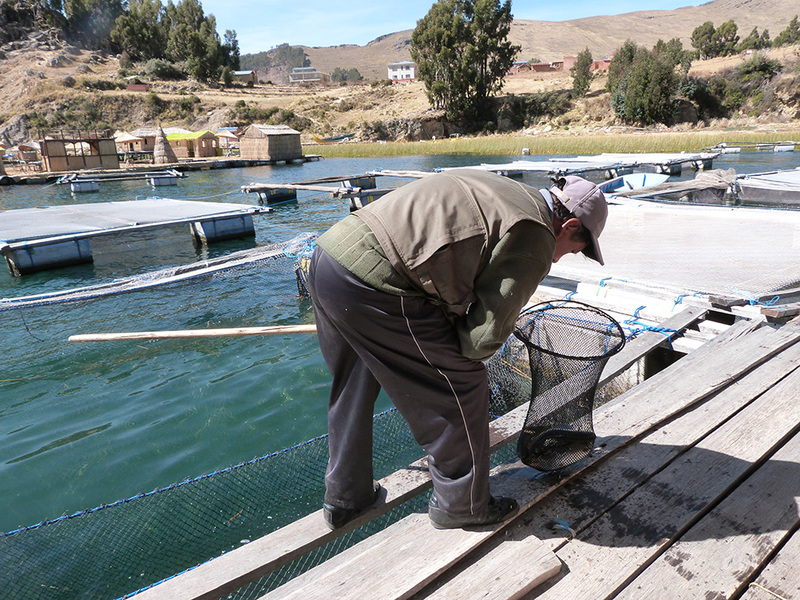 Lake Titicaca is famous for farming “trucha criolla”, which is one of the largest species of trout in the world. We ordered our dishes (mine, “sin cabeza”), then he went off to catch it. 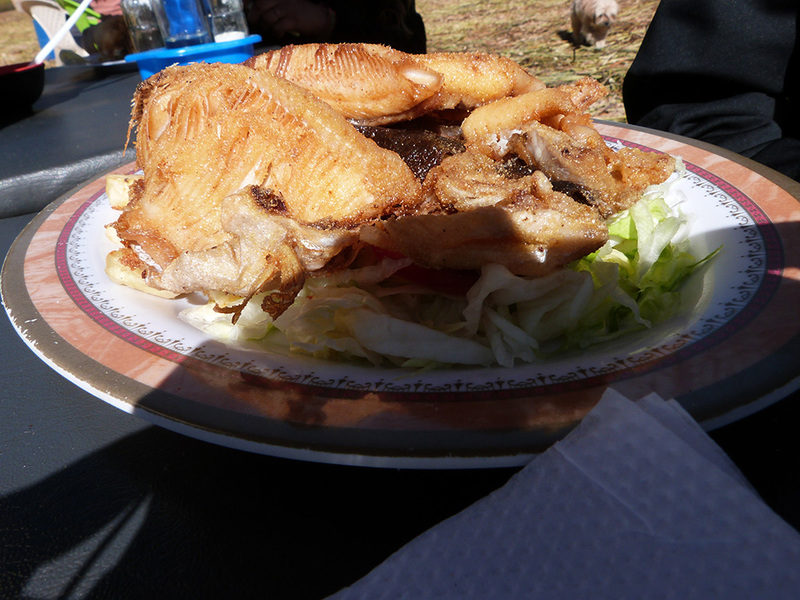 We each had a plate of fresh fried trout, french fries, rice and salad for 30 bolivianos, which is around $5. 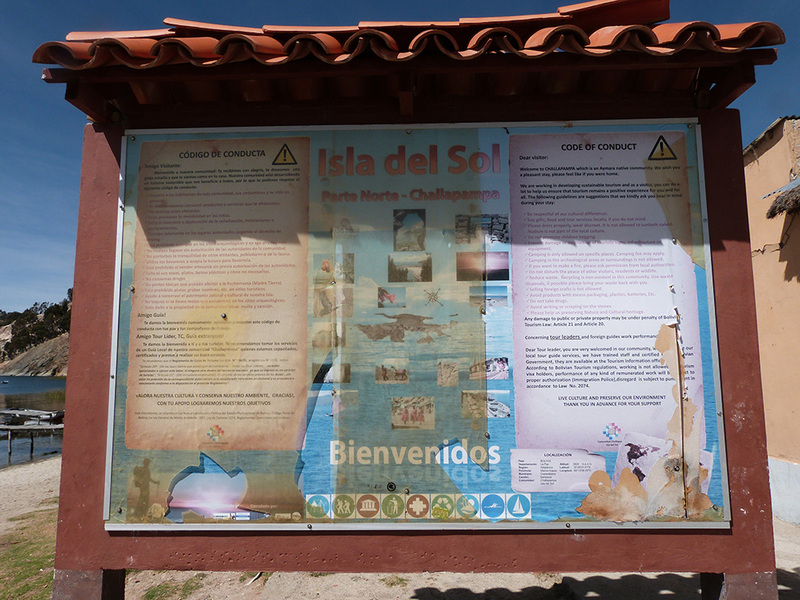 A standard tour of Isla del Sol begins around 8:00-8:30am. You can get a standard tour by just going down to the waterfront – there will be many people trying to sell you a ticket. It costs 40 Bolivianos for the day of transportation. The boat ride takes about an hour and a half to two hours. You can sit in the cabin or on the top level which is great for those that get motion sick. The boat takes you to the north end of the island, where you can choose to spend a few hours seeing the sites there and then returning to take a boat to the south end at 1:30pm, or you can see the sites at the north end and then take the 3 hour hike to the south end of the island. At the high altitude in Copacabana, which makes hiking more difficult, if you’re not great at hiking you may want to stick with taking the boat to the south end. It costs 10 Bolivianos to see the north end of the island, and an additional 20 Bolivianos to walk from the north to south end. The boat gets to the south end of the island around 2:30pm, providing about an hour to grab lunch and walk around but not enough time to head into the ruins. It costs 5 Bolivianos to enter the south end of the island. The boat leaves from the south end of the island at 3:30pm and at 4pm, and arrives back in Copacabana around 5:00/5:30pm. 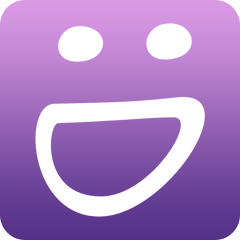 Lainie Liberti is a recovering branding expert, who’s career once focused on creating campaigns for green - eco business, non-profits and conscious business. 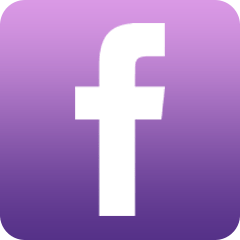 Dazzling clients with her high-energy designs for over 18 years, Lainie lent her artistic talents to businesses that matter. But that was then. Today Lainie considers herself a digital nomad who is living a location independent life. She and her son write and podcast their experiences from the road at Raising Miro on the Road of Life. Through Icefields, Jasper & Banff Amidst Mountain Peaks, Oh My! 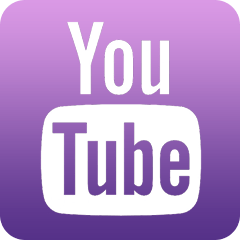 Numerology: Can Numbers Impact Your Life’s Outcome?